When a loved one needs 'round the clock care it may make sense for a carer to move into his or her home. 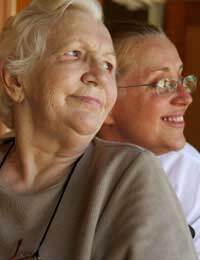 If you are considering moving into the home of a loved one to be a carer, make sure that you think of all possible angles in your decision, have a look around and make a plan for setting up your temporary home and work out a caring schedule so that you know you will still have some time for yourself. When you are thinking of moving into someone else's home to care for them don't be shy about investigating what this move will mean to you in terms of your finances, career, personal time, other relationships and emotional health. Moving in to another person's home will mean that you may be further from your own support systems, you may be further away from work or school, you may no longer be able to participate in set social activities or even attend your own house of worship. Ask yourself if you will be able to continue working, if you will need to cut your hours or if you will be able to work from home? Can you physically cope with the tasks of caring for someone and running their home? What will happen to your own home while you are away? How long do you plan to be away? Will moving to a new location affect any benefits, educational enrolments or medical catchment areas? There is a lot to think about when you are faced with the decision of whether or not to move into someone else's home to care for them, so don't be afraid to take your time with this choice. If you do decide to move in to care for someone, give yourself some time to look around your loved one's home and make a few plans for setting up your own temporary home. Pick out your new bedroom, investigate your bathroom access, make yourself comfortable with the kitchen and laundry facilities, find out about anything unusual or quirky that you might confront and talk to your loved one about cleaning and maintenance schedules. Consider moving in some little things that will make you feel more at home, from your own pillow and duvet to utensils and cookware that you think will be important. Discuss who will pay for running the home, including utilities, groceries, routine maintenance and transportation. It might be uncomfortable to have these conversations, but making sure that everyone is on the same page before you settle in can help keep nasty surprises and arguments from cropping up later. Just because you move in with someone does not mean that you should be expected to care for them single-handedly every hour of every day. Let your other family member and friends know of your plan and talk frankly with them about the help you think you will need. Let them know particular days, errands or chores that they could take over so that you can have a break. Ask your loved one about friends and relatives whom (s)he thinks might be able to help you out, and investigate if your local council, health authority, social services, charity organisations and religious groups will be able to offer you any assistance. If you think you might need to pay someone for assistance make sure you understand if you will technically become an employer and therefore need to conform to employment law. Moving in to care for someone is a huge decision and not one that should be taken lightly. Give yourself plenty of time to think about what this decision will mean to your own life, investigate setting up your temporary home before you actually move in and work out a caring schedule with others so that you will not need to shoulder the entire caring load without getting the proper support and rest.